I discovered metal as my medium in 1975, while taking a silversmithing class in college. I then trained to be a professional jeweler, working in gold and platinum. Despite a long, successful, career as a fine jeweler, I longed to create larger works of art. 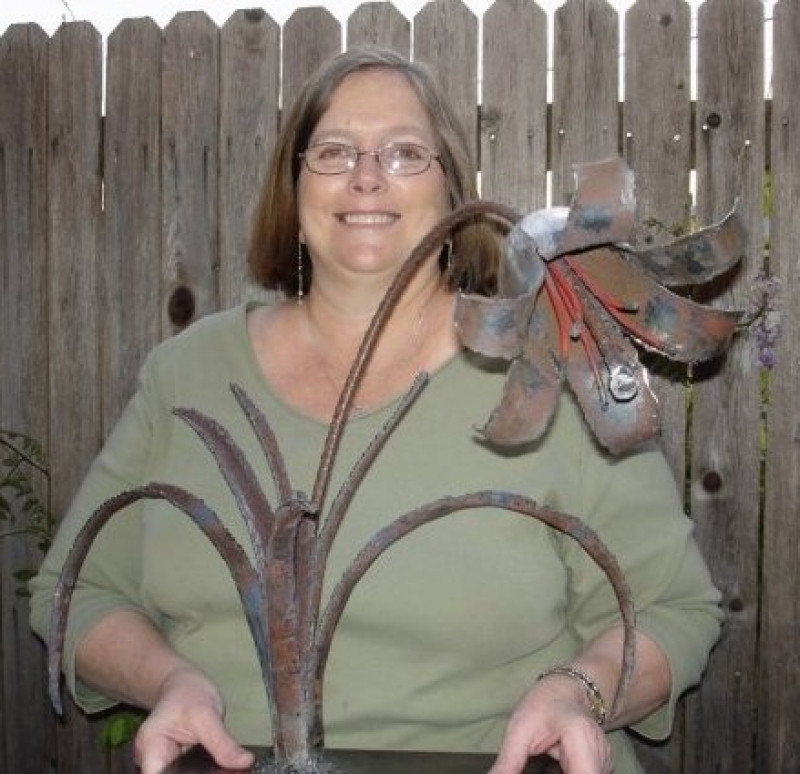 So, in 2007, I took my first Metal Sculpture class at the Creative Arts Center. I love working with steel, and am delighted with the success I am experiencing. Most of my sculpture is made with scrap metal and found objects. I find sheer joy in creating sculpture from junk-- old shovels, gas cylinders, car fenders, garden edging, patio furniture, plow shoes, some things I can't identify. The down side of making art in this manner is that collecting scrap metal becomes a compulsion! You will see me out scavenging on bulk trash week, and driving around with odd pieces of steel in my truck or car. My friends have given me gifts of old rusty implements, burglar bars, and even a lightning rod. I end up with little piles of metal everywhere-- the front porch, the storage closet, the bed of my truck, sometimes even in my living room! Given that I weld outside in the Texas heat, I could have picked something easier to do. But, I cannot imagine not sculpting. Depending on how you look at it this is either therapy or an addiction, since when I am welding, nothing else exists. Steel sculptures representing a variety of natural themes. I have been inspired by Texas native flora and fauna for many years. Mermaids, garden spirits, and other denizens of the unreal world.